Over the course of the past few weeks, I have been taking artists' drawings of baidarkas and put them in chronological order to get some sense of how the design of baidarkas may have evolved between 1760 and 1849. In the process of looking closely at these drawings, I found any number of improbable aspects to them, enough to make me wonder to what extent any of these drawings can be trusted. Comparison of drawings by various artists reveals a good deal of commonality, and the weight of numbers gives us some assurance that the things that all the drawings have in common are probably true. But there are also a number of differences between the various drawings and they make me wonder to what extent the differences were actually there and to what extent they are the product of invention or poor observation. 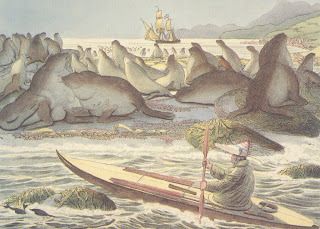 Let us look in detail at the drawings of Louis Choris because he is typical of the expedition artists that brought back pictures of the Aleutians. Louis Choris (1795-1828) was a famous German-Russian painter and explorer. He was one of the first sketch artists for expedition research. Louis Choris, who was a Russian of German stock, was born in Yekaterinoslav on March 22, 1795. He visited the Pacific and the west coast of North America in 1816 on board the Ruric, being attached in the capacity of artist to the Romanzoff expedition under the command of Lieutenant Otto von Kotzebue, sent out for the purpose of exploring a northwest passage. Choris is said to have "painted nature as he found it. The essence of his art is truth; a fresh, vigorous view of life, and an originality in portrayal." The accompanying illustrations may therefore be looked upon as faithfully representing the subjects treated by the artist. After the voyage of the Ruric, Choris went to Paris where he issued a portfolio of his drawings in lithographic reproduction and studied in the ateliers of Gerard and Regnault. I don't know who it was that said that Choris painted nature as he found it. Had they actually compared Choris' paintings with nature, they might have changed their mind. Before we look at Choris' drawings, let's take a detour and examine what we are actually looking at. Before the advent of various photographic processes, artists made drawings or watercolor or ink sketches. The artists' drawings were then transferred by hand to a lithographic stone or metal plate from which multiple copies could be printed. Several things are worth noting about this process. The person who did the drawing on the stone or on the metal plate was usually not the artist, but a specialist in copying drawings. If the handedness of the drawing was important, then the person doing the copy would have to produce a mirror image of the drawing on the stone or plate. Certainly, if there was any writing, that would have to be created as a mirror image since the print is a mirror image of the printing plate. Secondly, the image on the plate or stone would often have more detail than the original sketch. Things that were vague in the original had to be detailed out in the copy. If the artist was not on hand or if the artist couldn't remember the details, then the person doing the copy would invent the details. To summarize, when we look at the lithographs based on Choris' drawings, we are looking at images that may have been altered or embroidered on by the lithographer. So without any further delay, here are the works of Louis Choris as interpreted by an unknown lithographer. This is one of my favorite Choris drawings. 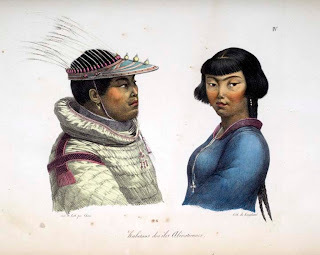 It depicts and Aleut man and woman. The man is wearing his gut raincoat and wooden paddling visor. The woman is wearing a European dress and a cross. 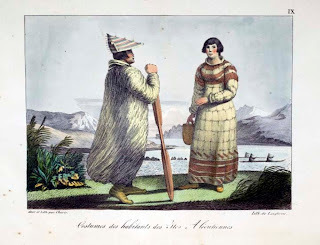 This is quite surprising since in 1816 when Choris made this drawing, the Russians had been in the Aleutians for only a little over 50 years. In any case, what is noteworthy here is that Choris seems to have done a pretty good job of depicting nature as he found it. The raincoat shows the individual seams in the raincoat running horizontally across the garment and some other details. Of particular interest are the sea lion whiskers on the man's hat. The whiskers on a visor would go on the off-side of the hunters hat so they wouldn't interfere with the throwing of harpoons or darts. This means that the hunter was either left-handed or the lithographer didn't bother to reverse the image. Here is another drawing of a man and a woman. This time, both the man and the woman are wearing traditional garb. Only now, Choris hasn't bothered to draw the horizontal lines on the rain coat but made it look as if it was made out of a single piece of fabric. The paddle is also curious. The shape seems reasonable, but assuming typical short stature of Aleuts of the time, the paddle would be a little less than 5 feet long and the loom would barely be big enough to get both hands on. My guess is that Choris liked the idea of the man leaning on his paddle and made it appropriately short. Or he might have seen a man leaning on a single bladed paddle but decided to substitute the double bladed paddle. Someone familiar with Greenland paddles might suggest that the paddle in the picture might work like a Greenland storm paddle. However, the blades would be too wide for the paddler to slide his hands along the blade the way the Greenlanders do. This picture is a closeup of an area to the right of the woman in the previous picture. It shows two baidarkas, a double in the foreground and a single in the background. What is interesting is that the paddlers in the double seem to be using single-bladed paddles while the paddler in the single is using a double-bladed paddle. So the question is, should we take Choris at face value and accept that the Aleuts at one time had short paddles, perhaps for special conditions or that Choris was being inventive? Let's look at some more pictures before we decide. This picture shows a paddler approaching a colony of Stellar sea lions. Most of the picture looks quite reasonable but two things don't. The first unreasonable thing is the way the paddler is holding his paddle. His left hand is overhand and his right is underhand. That is the way you would hold a canoe paddle. The only reason for making a double bladed paddle is that you can put both hands on top of the loom and shuttle the paddle from side to side without losing time changing the grip as in a single bladed paddle. It is possible that Aleuts invented double bladed paddles without realizing that they could put both hands on top of the loom. Certainly, the invention of photography eliminated this particular kind of grip. The second unreasonable thing is the length of the kayak's back deck. It appears as if Choris shortened it up to fit in the frame of the picture. If we take Choris at face value, we would expect the back of the kayak to sit much lower. Choris is guilty of two things here, the grip on the paddle is the result of poor observation. The shortness of the back deck makes Choris guilty of distortion for the sake of composition. This picture shows two baidarkas, a one holer with the skin on and a double with the skin off. The one holer seems to have been drawn from life. The frame of the two holer appears to be a work of the imagination. Choris was probably in the Aleutians for only a brief period and then only in the summer when the baidarkas would not have been without their skins. While the drawing of the double seems correct in some ways, it seems wrong in more ways than it is right. Choris may have briefly stuck his head inside a baidarka to see how they were put together. He got the longitudinal stringers and keelson right, but the spacing and placement of the ribs look like works of the imagination. It's hard to see in this small reproduction, but Choris also put the stringers inside the ribs. If you covered this imagined frame with skin, the ribs on the outside of the stringers would make bumps in the skin and a very slow boat. The drawing of the single is actually pretty good. 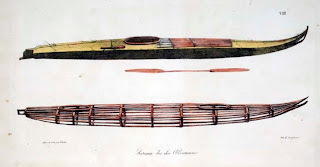 In a larger reproduction you can see three ribs inside the cockpit, evidence that this part of the lithograph was actually based on a sketch of a live baidarka and not the artist's memory and imagination. Finally, here is a picture of two men in a double. Again, both of them are using the canoe grip on their paddles. The baidarka seems to have reverse sheer, the line of the gunwales being highest in the middle of the boat and dropping off toward both ends. This picture is a combination of a static shoreline and the dynamic kayakers in the foreground. It is most likely a union of two different sketches, a detailed study of the unmoving shoreline and an invented view of the two kayakers based in part on memory and in part on sketches from life. In summary, I would say that the drawings of Choris do a good job of pointing out the problems of attributing historical significance to the drawings of any artist. A drawing is simply not the same thing as a photograph. The artist has certain limitations which are difficult to overcome. For one thing, drawings take some time to produce. They can be quite accurate if the artist is drawing a static subject. If the scene that the artist is trying to depict is dynamic, the artist has a number of options. He can do quick sketches of parts of a scene and then combine them to create a unified whole. All this takes time and the sketches may be all that the artist had time to make. The final product may not have been produced until the artist returned to his studio after the trip was complete. Once photography was available, artists used it widely to get recordings of details that were too difficult or cumbersome to draw on the spot. Back in the studio, they would create their composition and fill in the details using the photographs. Prior to the invention of photography, artists had to rely on their sketches to record factual details. Where they hadn't recorded the details, they resorted to their imagination or memory. When people build replicas of baidarkas in artists' drawings, they might want to ask themselves how accurate these drawings are. Worst case, a baidarka based on an artist's rendering will simply be a bad boat and evidence of the artist's deficient skills of observation. Best case, a baidarka based on an improbable looking drawing may actually reveal useful design features that have been lost to following generations.